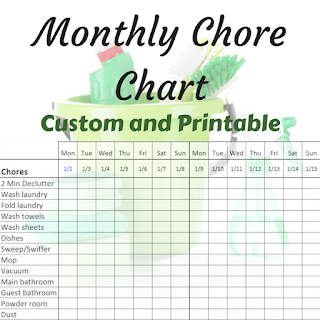 I recently did a quick search for chore charts. Holy cow, there are a million of them! 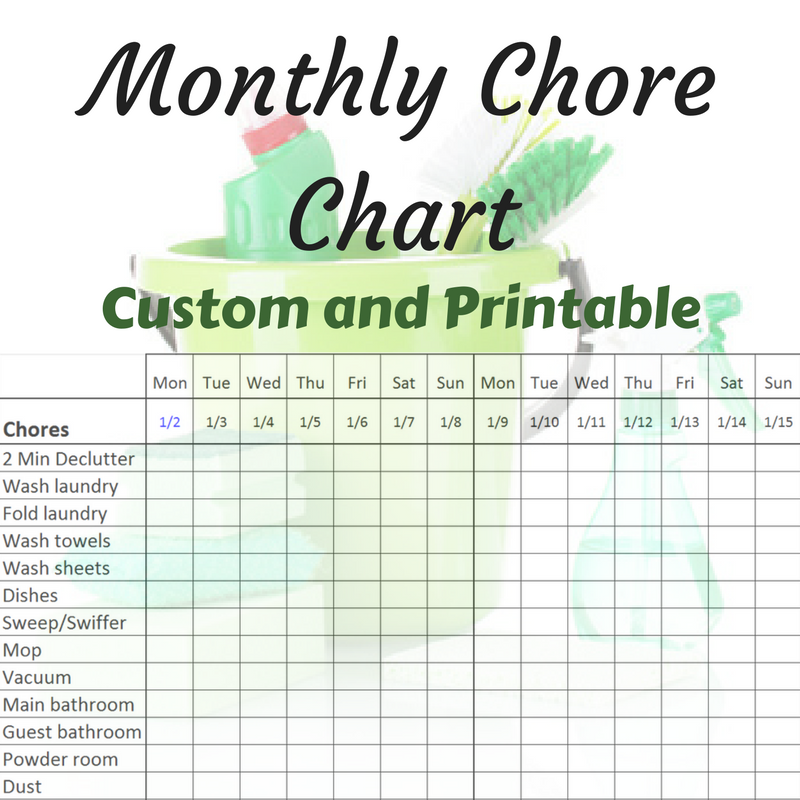 It seems that everyone has or needs a way to manage their day to day chores. I've tried plenty. Tried and tried and eventually discarded. This is the only one I've ever used consistently. I'm a mom of two very young children. And when I hang out with my other mom friends we all have the same problem: there is never time to get anything done! Any mom can relate. You somehow run around all day, busy as a bee, but at the end of the day there is nothing to show for it. I won't elaborate on this, because plenty of other people already have, but here are a few things that I have learned myself. For me, it's doing the dishes. Even though emptying the dishwasher is a pain, I always seem to find time to do it. Lately, my two year old likes to sort the silverware (sometimes successfully), so it's an easy way to keep him entertained for five minutes. As for washing and loading, that's not too bad either, because my husband and I have a routine. I love cooking, so dinner is (almost) always ready when he gets home from work. We all sit down to eat together. The toddler lasts about ten minutes and is then off to play with his toys. 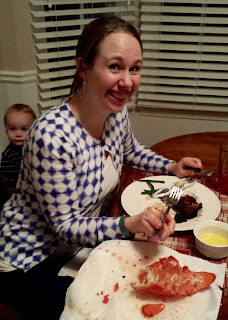 My husband and I finish dinner, sometimes standing up if the baby is being cranky, but we get to spend a few minutes chatting with each other and going over our days. As soon as we've eaten the last bite, I practically throw the kids at him. Usually by that time, I really just need a break. While he's keeping them entertained, I clean the kitchen without interruptions. It's great. My husband gets to play with the kids, I get a few moments of peace, and the kitchen actually gets cleaned! Win win win! Laundry. The bane of any mother's existence. And I only have two kids. I don't even know what houses look like with four or five or eight kids running around making clothes filthy. But no matter how many littles you have, eventually, everyone runs out of underwear. Someday, I want this laundry room (and the seemingly responsible kids that go with it). For now, I have to live with what I have. Putting clothes into the washer and dryer isn't bad, but the folding and putting away kills me every time! Clothes get washed, dried, put in the basket and taken upstairs, only to sit there for days on end. Sometimes I'll try the trick of putting them all on the bed so that we have to put them away before bed, but then all that happens is when we get to our room at night, we shove all the clothes onto the chair (or floor) and say we'll worry about it tomorrow. Everything gets very wrinkled this way. Day in and day out, I'm picking up toys, shoes, jackets, bowls, sippy cups, cheerios (or whatever the dog didn't want), burp rags, etc etc etc. Meanwhile, I'm chasing around a toddler while carrying a baby and hoping that they're both happy and fed. Don't bother asking me when I last dusted. Or cleaned the shower. Or washed the sheets. Ya'll know what I mean. And then there are some things that don't need to be done often, but get more and more necessary as you ignore them. I'm thinking about giving the dog a bath or cleaning and wiping out the fridge. Sometimes I can see that said chore has been ignored, but mostly I'm too busy focusing on all the craziness of the day that it gets missed, or I don't notice until it's late and I have no energy left to do it. My system is pretty simple, but it's been working for me for a couple of years now. I print out the sheet below and stick it on the fridge. Then every day, I review to see what needs to be done. My goal is usually to do at least one thing on the list. I like that it's clear when I haven't done a certain thing in a while (like cleaning the shower), and I always feel so good about myself when I look and see the things that have gotten done (even if you can't tell through the kid mess). Here are a few tips to get you going on using this file. Change the date in cell B3. The days of the week, month, and the other dates will all update automatically when you do this. Change, delete, and add to the chores list as you like. The ones listed here fall into one of three categories: chores I forget, chores I want to brag about having finished, and chores I need to force myself to do. If you need more space, highlight an entire row by clicking on the row number on the left, then right click and select Insert. Please tell me if you have trouble with this. I prefer to print four weeks at a time and hang it on the fridge. I throw it away when I'm done and print a new copy. You can also leave it on the computer and add an "x" whenever you complete a chore. Then just clear the spreadsheet and start over. I hope this helps you keep your house as clean as you can. What are your favorite and least favorite chores? Here are my current favorite Link Parties and how I keep track of them. I could put in a whole thing here about why I haven't posted a single post in over a year, but no one wants to hear my sob story, right? Let's get on with the recipe. We had friends over for dinner this week, and had decided to do Mexican. I made enchiladas and of course needed to make my favorite corn and bean salsa. As always, I turned to Pinterest to check out the collective favorite recipe. And you know what? I didn't like it! I looked through recipe after recipe and they were all either missing an ingredient I liked, or had extra ingredients I didn't want. And so, here is mine. I actually got it from my sister-in-law years ago, but I don't think she'll mind. I feel like we make this whenever the family gets together. In fact, there have been some pretty massive fights over how much hot sauce to include. 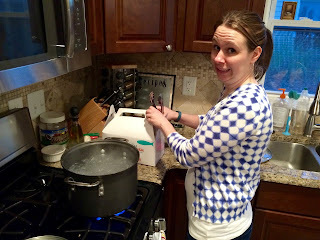 I'm a wimp and don't put in any, while my brothers like burn-your-tongue-off hot! My little brother once added more hot sauce when I wasn't looking and he and I had a huge shouting match, much to the surprise of my new husband! But all that's behind us and we can at least all agree that this is the best fresh salsa recipe there is. There isn't much explanation needed here. Simply dice the tomato and onion, drain the beans and corn, chop the cilantro, and add seasonings. That's it! 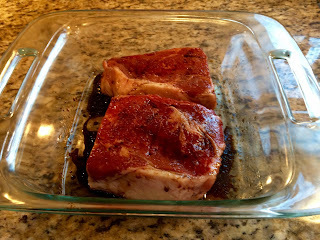 I find that making it the night before and letting it marinade brings out the flavors. Try not to eat it all yourself! Serve immediately with chips or cover and refrigerate up to 3 days. I know, I know. 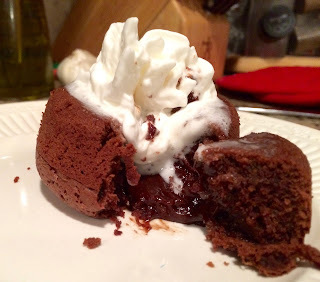 Everyone has a molten lava chocolate cake recipe. It's getting a little overdone. Eh, who am I kidding? What could possibly be overdone about rich, gooey, chocolately goodness?! I'm not sure where I originally got this recipe, but I've been using it for years and it's my favorite for two reasons: 1. It uses only a few ingredients that you probably already have in your pantry, and 2. It is so easy!!! Just wait till you see how simple this recipe is. Start by microwaving half a stick of butter with 2 ounces bitter or semisweet baking chocolate for about one minute. 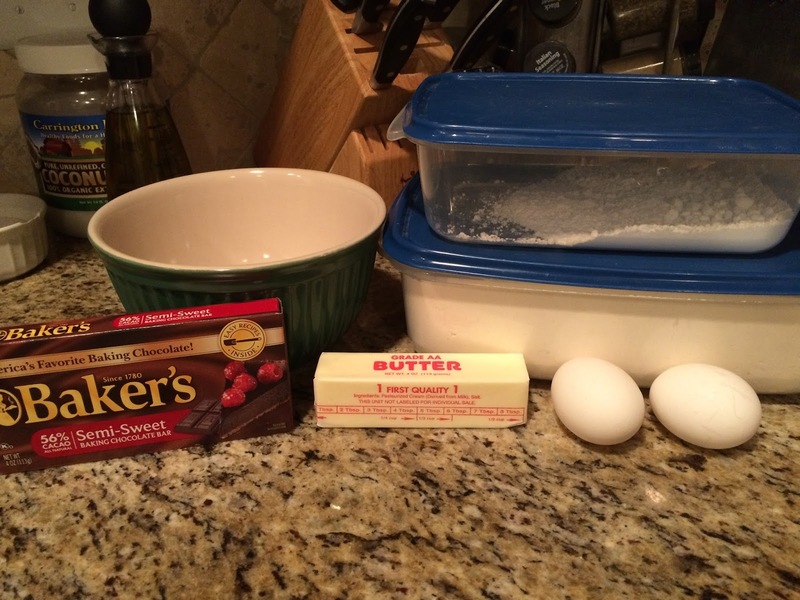 The butter will be melted and the chocolate starting to get soft. Whisk them together until the chocolate is fully melted and the mixture is smooth. Add all the remaining ingredients (sugar, egg, flour) one at a time, whisking after each ingredient. Allow to cool for a minute, then run a knife around the edge and turn onto a plate. I love mine topped with some whipped cream. And that is all there is to it! I love whipping these up for a relaxing night with my husband. 20 minutes (including baking time) and we have a rich dessert to indulge in! 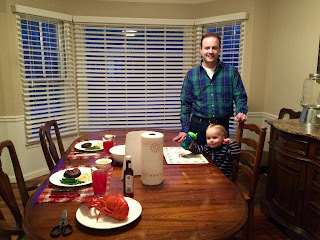 I decided to make them this weekend to complete our Surf and Turf Valentine's. 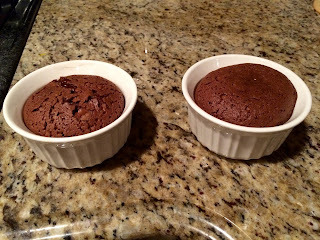 One of the other great things about this recipe is that, instead of using 1 cup ramekins, you can use muffin tins and make "mini" cakes. Bake them about 7-8 minutes and they're great for a double date! Preheat oven to 425 degrees. Grease well two 1 cup ramekins. 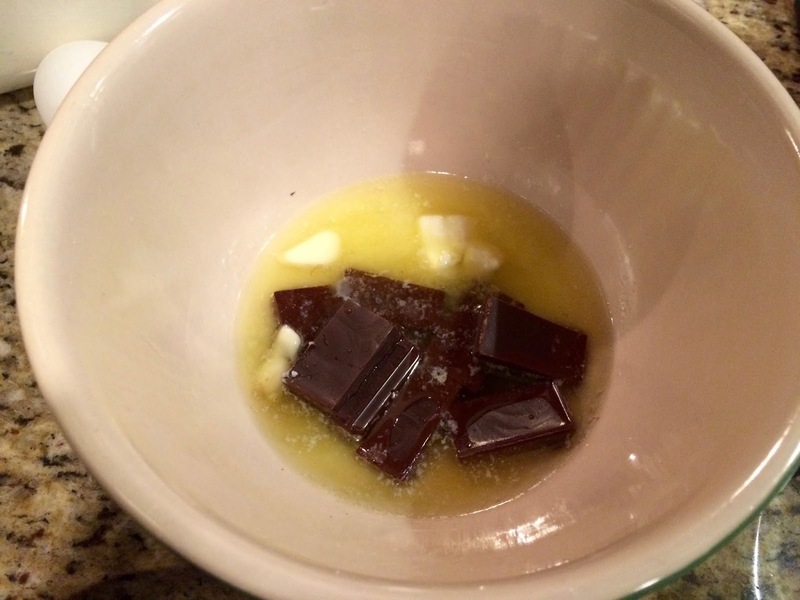 Melt chocolate and butter in microwave for 1 minute. Whisk until chocolate is fully melted and smooth. Add remaining ingredients, whisking after each addition. Allow to cool a minute or two, run knife around edge and turn onto plate. May be served with whipped cream, ice cream, or fresh fruit. *To make "mini" cakes: use muffin tin instead of ramekins and bake 6-8 minutes. Will make 4 mini cakes. I decided to be adventurous this Valentine's Day. You see, my husband and I went to Disney World last week, and even though a lot of it was paid for, our wallets were feeling a little thin. Also, we were exhausted. (I hope to do a full post on the trip later, but let me just say that a toddler with the stomach flu put a damper on the whole experience.) We really weren't up to a big night out complete with finding and paying a babysitter. Plus, we had a church conference Saturday night and Sunday morning, so going out again just seemed too much. A coworker of mine said that he and his wife would do lobster at home for Valentine's, and I thought it sounded like a great idea. And how hard could it be? I did a little internet reading and said, I can do that! Since the lobsters were pretty pricey, I decided to go surf and turf and picked up a couple steaks. I made up a quick marinade of soy sauce, garlic, and oil and got them ready for the grill. 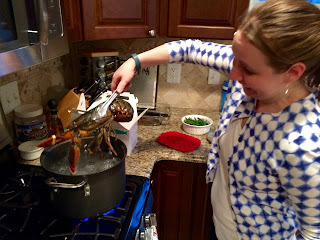 In actuality, cooking a lobster is really easy. 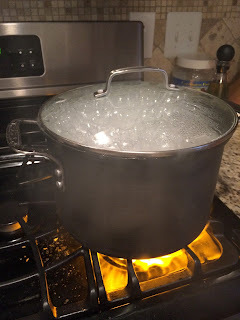 You bring a large pot of salt water to boil, put in the live lobster, and allow it to cook for about 15 minutes, depending on how big it is. 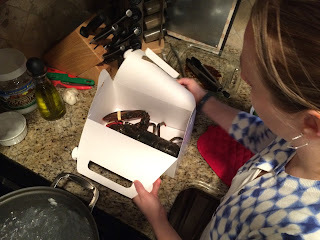 I must admit, it was odd to bring home a crustacean and plan on boiling it alive! I was kind of afraid it was going to escape! But, it was fairly docile and didn't put up much fuss. :) I tell you what, though, it was heavier and more slippery than I imagined! I thought I might drop it! Here he goes, into the pot! We did have one ... issue, I guess you could call it. 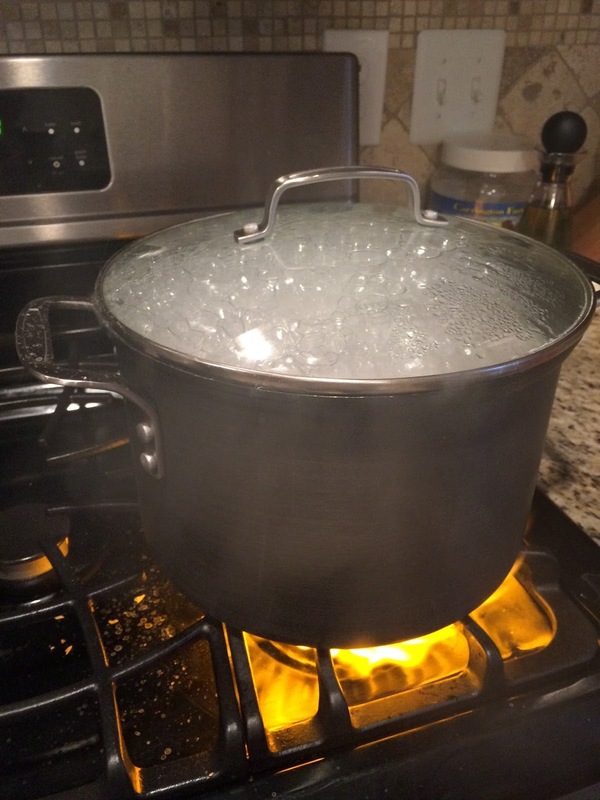 No one said anything about how bubbly that pot was going to get. 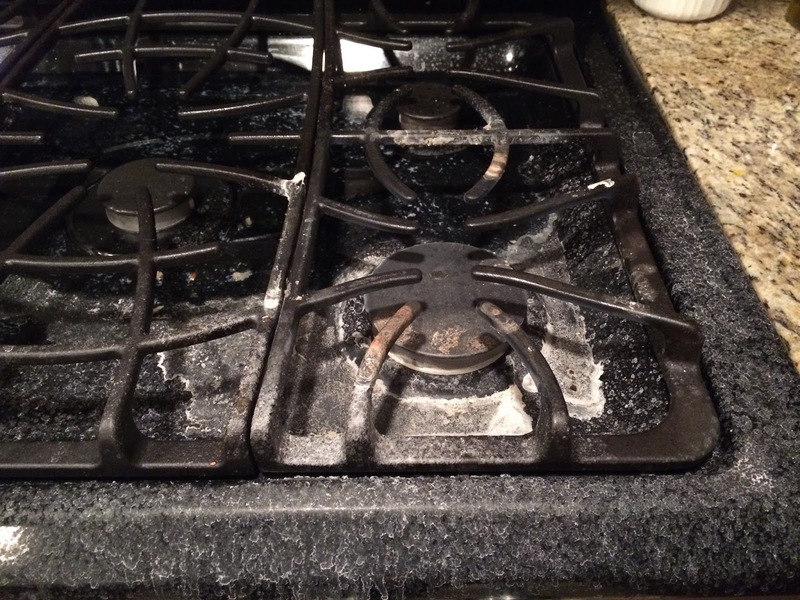 The gas burner was going nuts as salty, fishy water escaped the pot and splashed everywhere. It made a huge mess! 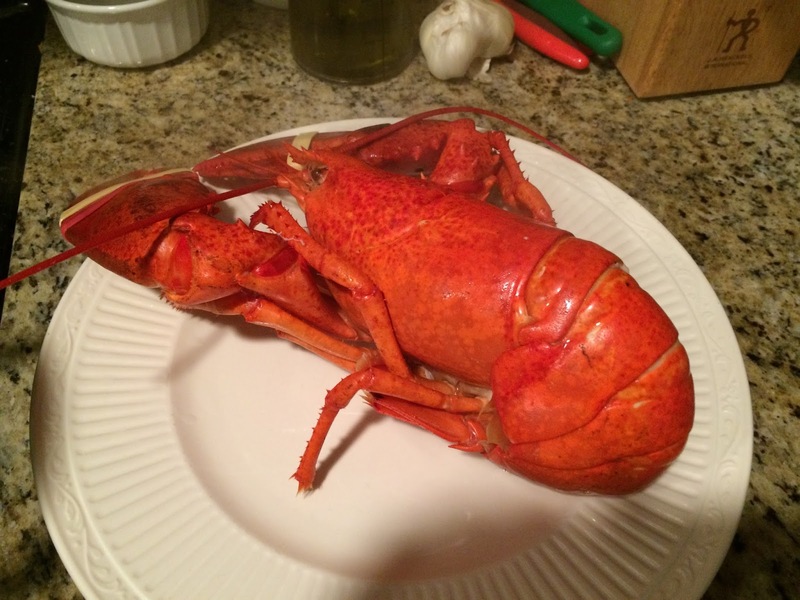 Does anyone who's done lobster before know what I did wrong? Or is this normal? Either way, the lobster came out looking nice bright red and yummy! Though, at first glance, you do wonder how people learned to eat these things. 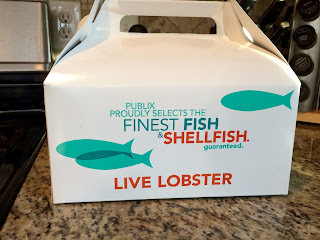 As my husband says, "whoever first decided to eat one of these must have been really hungry!" Add some fresh green beans and rice pilaf and we had ourselves a meal! This is the best I have, and it's really not a great picture of me, but at least I can prove that we did tear into that lobster and eat everything that we could. I feel a tradition in the making! 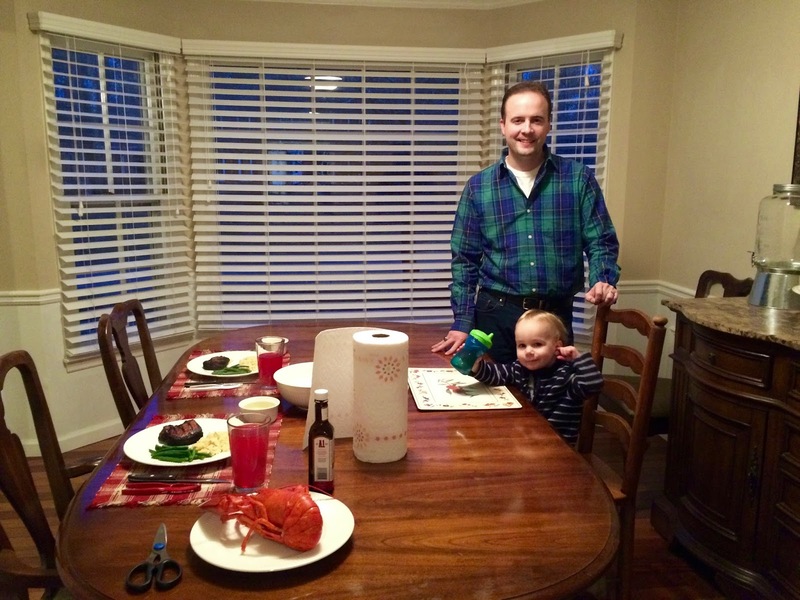 What Valentine's traditions do you have? If you actually came to visit this page, you are either very kind or perhaps looking for a laugh. Or maybe you just didn't actually believe that someone would post a blog report with such pathetic numbers. I'm really writing this for me. I'm hoping that starting a habit of writing blog reports will help to motivate me and give me measurable goals and progress. I started my blog three months ago, so honestly, I feel like I'm doing pretty well. I've already learned a ton about what kinds of things bring visitors besides perfect pictures and headlines. You have to get your name out there, and have content that people are interested in. Still, some of my most popular posts have surprised me. My original goal for January was to get 2,000 page views, but sickness in the house caused a speed bump and I basically took an unscheduled week off. I'm sure this is why I didn't hit my goal. 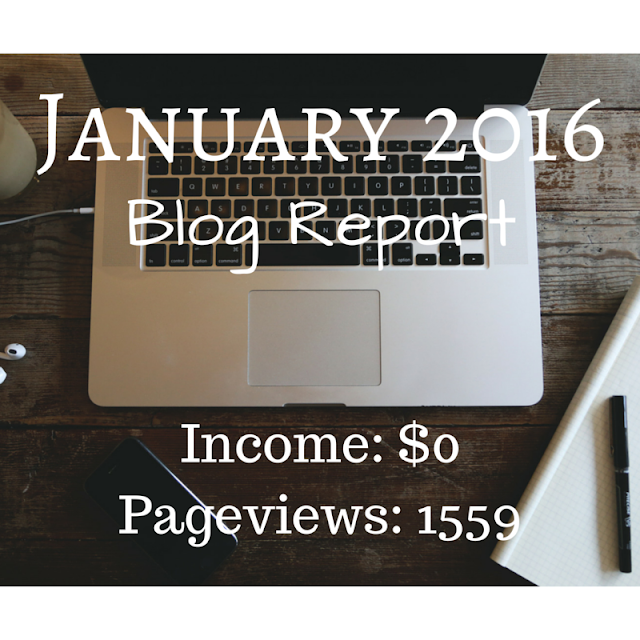 My favorite social media sites are Pinterest and Bloglovin', so that's all I'm showing in this report. Obviously, Google is the best place to check my pageviews. You can see clearly the spike on January 15, which is oddly from my third most popular post: Home Reorganization Stage 1.1. But that's one that I posted on my personal Facebook page, so I'm sure I just had lots of friends check that day. Overall, I'm happy with the fact that views have remained fairly steady despite the fact that I didn't link to nearly as many parties this month. 25 followers might be kind of sad, but I think it's a good start. 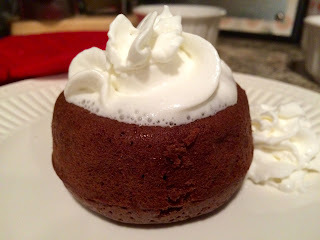 I'm actually more thrilled by those few Likes and Repins on my Sticky Toffee Pudding and Link Party Tracking Sheet. So if 25 Pinterest followers is sad, I don't know what 4 Bloglovin' followers is. But again, as I'm just starting out, it seems like a lot to me. I was very proud of this one. I had been planning it for weeks before finally posting it, and still hope it's being passed around among bloggers to be used. I got three features on link parties which really boosted my view count. This one still surprises me. It was a last minute post based on a recipe I'd been meaning to try, but with a couple party features, apparently people have liked it! I'm struggling with this part a little, because while I want to push myself, I'm still learning what I'm actually capable of. I don't want to set a bunch of goals and not make any of them. I'm also learning that I have two types of posts that I write: those that are just fun and those that have some substance. I like to think of the former as "fluff." They're easy, and sometimes get me some views, like my recipes, but mostly they're filler. 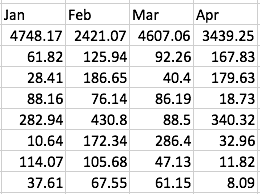 Because what my blog is really about is helping people learn Excel and providing specific spreadsheets for them to use. But my spreadsheet and tutorial posts take a lot more work. That's a good thing, since they're the substance of my blog, but that just means they take time and effort. Publish at least 3 fun and 2 Excel posts. Be better at visiting new blogs and commenting on their posts. Increase traffic to 2,500 views. Eventually I'd really like to work on creating custom spreadsheets upon request and perhaps host Excel trainings, but I don't think I'm ready for that yet. If anyone reading this has interest in that at all, please let me know so I can get working on it sooner rather than later. Basically, I have a lot of work to do. I knew when I started my blog that if I actually wanted to turn it into a business and make money, it would take a lot of time. I'm still learning the best ways to apply that time, but think and hope that I'm off to a good start. Here goes nothing for February! Excel is all about numbers, right? Well, sort of. Certainly it makes calculating things much easier, but I also love how nice and organized the grid is. But that isn't the point of this blog post. Today I want to talk about number formatting. Have you ever seen a table that looks like this? Ugh! What a mess! First, it's hard to read. Second, you have no idea what you're looking at. Money? Counts? Percentages? One of the most essential skills in Excel is knowing how to format your numbers for easier reading. Like anything in Excel, there are several ways to do this. I'll start with the simplest and most straight-forward. In the Home tab of the Ribbon are several number formatting options ready to go. See the Number section of the Home tab. There are a few formats that you can choose with one click. These are the buttons directly above where it says Number in the Ribbon. See those two buttons with all the zeros? If you look carefully, you'll see that one shows one zero turning into two, and the other has two zeros turning into 0. That means that one button will increase the number of decimals shown and the other will decrease the number of decimals shown. Above the one click format buttons, there is a drop down with a few additional options. No specific formatting. This will display your number with no formatting and all the decimals. This will display the number with no symbols or commas, but will default to two decimal places. Same as above, currency will add a dollar sign, a comma to denote thousands, and two decimal places. Very similar to currency except that negatives are denoted by parentheses () rather than a negative (-). Also, the alignment will shift so that decimals and thousands will line up with other numbers in the column. Will display the date as M/D/Y. Will display the date as Day, Month Day, Year. Similar to above, percentage will multiply the number by 100, add a % sign, but will now include two decimals. 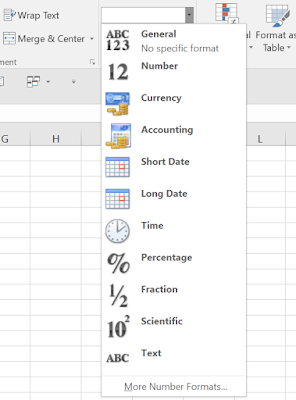 Excel will round any decimals to a fraction with a single digit denominator. Remember that old 4.24 x 10^4 format you learned in school? That's that this is, though is uses E to denote the 10x. You have to be careful with text. Excel will start treating your number like it isn't a number anymore. I would only use this if you really know it's what you want. If you haven't found a format at this point that fits your exact needs, you can find more options in the drop down under More Number Formats. A pop up window will open. Notice that all of the drop down formats are listed, but if you click one, there are several more options listed. 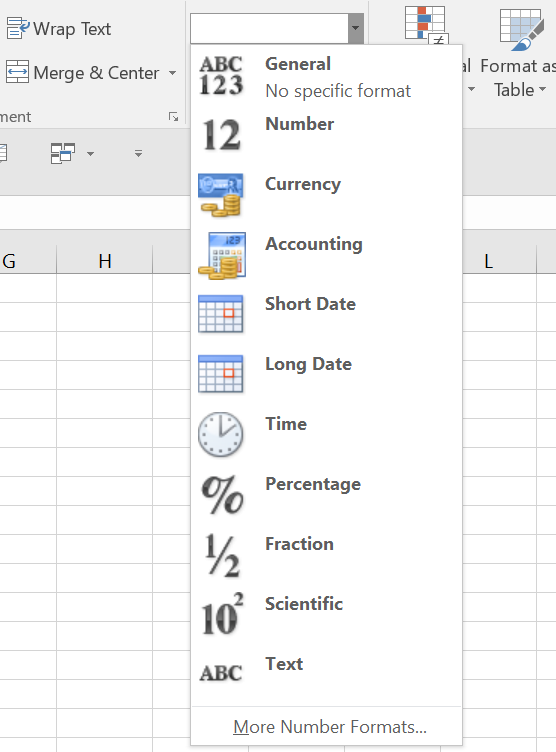 Excel will even show you exactly what the number will look like under Sample. There are two new formats listed here: Special and Custom. The purpose of this post is to do the basics, so I'm going to talk about those in a separate post where we can go into the details. For now, you should have enough to get you started in building your tables and spreadsheets and making them easier to use. As always, don't be afraid to try some things out, and feel free to email me at excealathome.blogspot@gmail.com. So you've been learning how to use Excel. That's awesome! There are so many things that are much easier to do in a spreadsheet rather than writing them down or calculating by hand. But sometimes, you do want to print that spreadsheet and file it somewhere or maybe hang it on the fridge. And that requires knowing the basics of Page Setup and Printing. There are four main places where you can edit what will display when you print. While I walk through these in a certain order, you can adjust them in any order and it should work just the same. Check out this video for a full walk-through where I format my Link Party Tracking Sheet. Check the Print Preview. You can do this by clicking File -> Print from the top left corner, or I have Print Preview in my Quick Access Toolbar. Take note of what the page looks like. Does everything fit? Are you missing any of your data? Are the gridlines showing (or not)? You can adjust all of these things and more before you print. Print Active Sheets - You can tell Excel to print the Worksheet you currently have open, all the sheets in your file, or just the part of your sheet you have highlighted. Your choice! 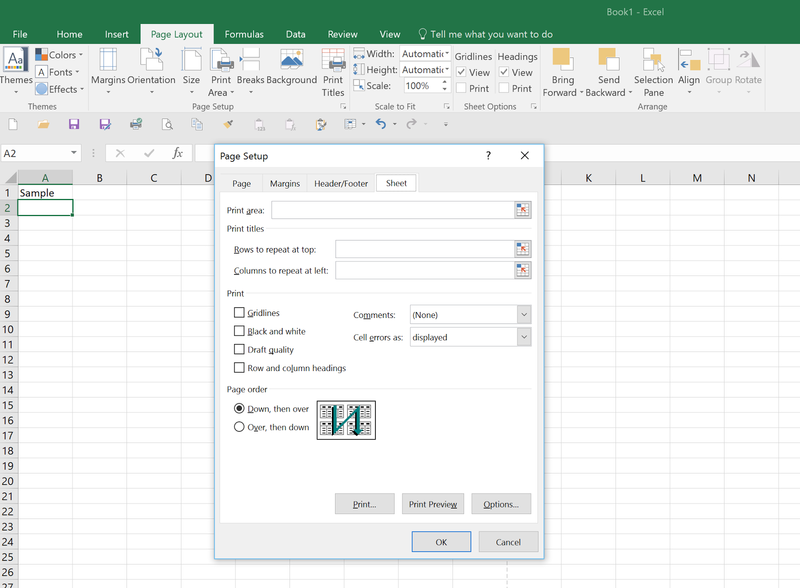 Pages - If your spreadsheet is huge, you can tell Excel to only print a few of the pages. Just give the page range. Be sure to check to the right at the preview to make sure you get the right ones. Collated - If you're printing multiple copies, you can decide what order you want the copies to print. Orientation - Choose which direction the paper goes, Portrait or Landscape. 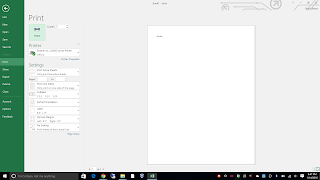 Page Size - If you're printing on something other than 8.5" x 11", you can change that here. 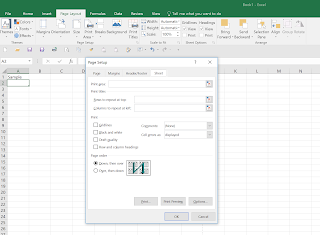 Margins - Excel with automatically print with 0.7" margins unless you tell it otherwise. Scaling - This can be a very handy tool. If you know you want your spreadsheet to print all on one page, or have all the columns on one page but let the rows continue, you can change that here. Pay attention to the preview! Sometimes scaling really shrinks your sheet or creates strange white space. Make sure it looks right before printing. Okay, so you went through all the Print Preview options, but there are still things you want to change. Now what? Your next stop is Page Layout. Click the arrow at the top left to return to your file and then select Page Layout in your Ribbon. There are too many options to really go into detail, but here are the highlights of this section. Colors and Themes - Excel (and Microsoft) come with an automatic color scheme. This includes all the font and highlighting colors. But you can change it to any set of colors you want. Print Area - You can select any section of your spreadsheet and have only that selection print. Breaks - Insert and remove page breaks in your file. Note that the break will appear based on what cell you currently have selected. Pay attention to the blue dotted lines that display in the spreadsheet. Headings - Choose to show the column and row headings when you print. Within Page Layout, there are a couple more detailed menus that you can access. Simply click the small arrow near where it says Page Setup. A dialogue window will open. Rows to repeat at top - Select as many rows as you want to appear at the top of every page you print. Columns to repeat at left - Select as many columns as you want to appear at the left of every page you print. The last place I like to go when preparing my file to print is the Page Break Preview. Click on the icon at the bottom right of the spreadsheet. This will display all the page numbers and page breaks. To adjust, simply click and drag the blue lines marking the page breaks. You should now be all set! Double check the Print Preview (or Page Layout View) to make sure what you wanted is coming out correctly. Sometimes you have to rescale or double check your page breaks, but it should come out just how you want it. As with anything, there are multiple ways to do things in Excel. I've just shown you my favorite ways to format my files to print. Please let me know if you need extra help or have questions. Have fun! I like to join these Link Parties.